Good morning! I pulled out this sheet of Basic Grey Nook & Pantry patterned paper out a couple of days ago, but it didn't quite work with my layout, so I set it aside. I noticed it sitting on my craft table, matted and already stitched, so I decided to use it with Card Positionings Systems Sketch 145. When I first saw the sketch, I immediately thought of Claire's set, Seasons of Love - Tags, so I stamped the star and sentiment and cut it out with my largest star Nestability. She has several sets like this that are Nestie friendly -- they are SO fun and versatile! Accessories: Star Nestabilities (Spellbinders), Swiss Dots embossing folder, Arch lattice border punch (Martha Stewart), Ribbon, Twine (May Arts), Button (Papertrey Ink), Rhinestone, Foam tape, Thread, Sewing machine. Gorgeous! 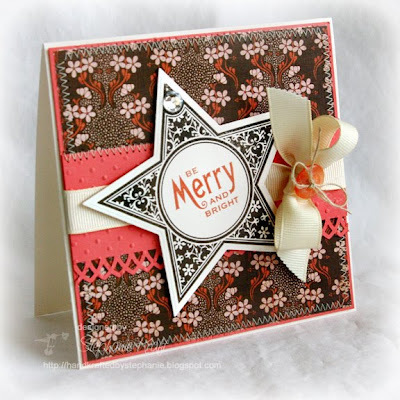 I love the pink and brown for a holiday card! Wow, LOVIN' the look of that big star with that GORGEOUS DP! So pretty! Love those colors together. This is gorgeous Stephanie!! That star is fabulous, and I love the added ribbon! Thanks for playing at CPS this week! Fabulous - so cheery and bright! Beautiful take on this week's sketch! Really love it!